There are many reasons why professional copywriting is worth the price of admission, and they start with the history of modern marketing itself. During its coming-of-age throughout the 20th century, marketing was more than just a tool to drive sales: it was also used extensively to inform. Print ads and billboards made bold, sweeping claims about the benefits of everything from sedans to hairspray, claims that frequently sounded—and in many cases, were—too good to be true. Take, for example, the downright glaring advertising campaigns of tobacco companies in the 1940s. Health concerns surrounding cigarettes were growing. 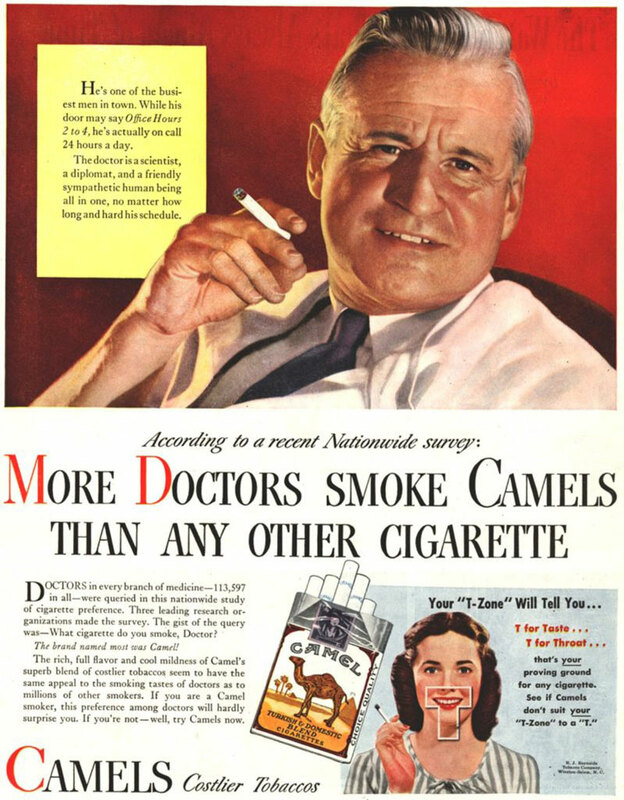 Tobacco companies went on the defensive with advertising campaigns appealing to the authority of healthcare professionals. At best, ads like these portrayed cigarettes as benign. At worst, they made out pipes and cigars to be genuinely beneficial to health. And as the harmful risks of tobacco smoking became better understood in the decades that followed, these ads were remembered by consumers. Think of these as the ‘smoking gun’ of advertising. Deceptive tobacco ads were not exceptions to the rules of early modern marketing. All kinds of products were hawked to the public with the same overconfidence. Some were similar attempts at damage control, such as ad campaigns defending the use of lead in consumer products when its health risks came to light. Others simply promised desired results through questionable means: one well-known magazine ad peddled ingestible tapeworms as a weight-loss aid. These misleading, sensationalist claims may have seemed like good practice at the time, but they went on to colour consumer perception throughout the late 20th century, and laid the foundation for a cultural backlash that has since built up to the present-day peak in consumer skepticism. Other factors exacerbated the effect. When cable television made its debut, it was introduced as a paid, ad-free alternative to the commercial-laden free broadcast networks of the era. Today, cable networks air more than 15 minutes of advertising per hour of programming1. Many magazines and newspapers have ads on every page. And advertising is so pervasive on the internet that more and more users are turning to ad-blocking browser extensions to stem the tide (as of February 2016, the share of German internet users aged 18-34 with ad blockers installed was nearly 50%2, with the U.K. and U.S.A. not far behind—and even higher in the 18-24 age bracket3). Today’s consumers are bombarded with marketing from the moment they open their first smartphone app in the morning until they turn off their TVs at night. The compounded effects of constant advertisement and cultural mistrust for sales messages have made marketing an incredibly difficult task. Today’s consumers second-guess everything—and they have the resources and access to information to do extensive research. Any words disseminated to the public are certain to be picked apart down to the letter. And through the power of the internet, consumers will hear about every flaw in your marketing message, be it deceptive spin or honest mistake (and the latter will be readily interpreted as the former). In a world where every marketing message is greeted with relentless skepticism, it’s crucial to be honest and forthright with potential and existing customers. But that alone is not enough. The simple reason is that in this marketing environment, consumers only begin to analyze sales and advertising after they’ve decided to acknowledge them in the first place. A business can wear its heart on its sleeve and still be ignored, unless it manages to capture the attention of consumers with a positive first impression. This is where the professional copywriter becomes crucial. 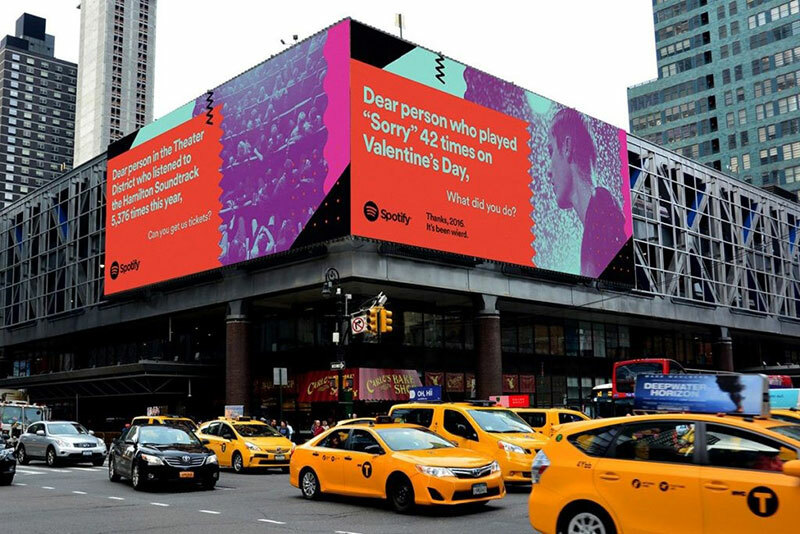 Spotify dug into their mountains of data to find funny and poignant examples of how listeners used their service, and shared them with brief but memorable copywriting. When marketers are met with suspicion, every word is second-guessed, and platitudes are readily seen for the transparent promises they often are. It takes a deft hand at wordplay to penetrate those psychological defenses and earn the ear of the target audience. Consumers are accustomed to resisting “sales speak.” Appealing to these consumers requires a carefully-crafted message that resonates with them, that they can identify with, and in many cases, that doesn’t present itself as marketing in the first place. This bears out in the results of the Nielsen Global Survey of Trust in Advertising, which in 2013 found that the most trusted forms of communication from organizations are the ones in which a copywriter’s services can be most effectively employed: branded websites (69% trusted) and editorial content such as articles (67% trusted). In 2017, consumers don’t want to be sold to. They don’t want to be advertised at. And they certainly don’t want to be told what they do and do not need or want. They expect to decide these things on their own, and then seek out their own solutions. This is reinforced by the same Nielsen survey, which found that direct peer-to-peer interactions like consumer opinions posted online and word-of-mouth recommendations also earned strong trust: 68% and 84%, respectively. Using humour to bridge the ‘trust gap’. A copywriter’s unique talent lies in blurring the lines between these most-trusted forms of communication. That’s the “secret sauce” that will motivate your audience to let your content through their filters and listen to what you have to say. A skilled copywriter can communicate your brand with the authority of official media, the familiarity of a trusted peer, and a personality that will make the content memorable. This is the approach that helped Old Spice go viral with its ad series featuring “The Man Your Man Could Smell Like”. Rather than take a traditional advertising approach, these ads play out like a joke that the audience is in on. They show that the brand doesn’t take itself too seriously, which makes it feel accessible and down-to-earth. And they make perfect use of creative humor, which is one of the best tools to build rapport with consumers and motivate them to remember and consider your product. Although text-based marketing copy may differ from a TV ad, the principles are essentially the same. Trust in your copywriter and you can reap a similarly engaging message. Copywriters are masters of balance. Conveying accurate information is important. Search engine optimization is important. But on their own, they’re not enough. Information is only useful after your audience commits to reading it. Even the best SEO can only bring more visitors to your site—it won’t convert those visitors into customers. With the expertise of a copywriter, your value proposition and SEO can be packaged together with style into copy that’s concise, personal, and appealing. Those qualities will make it resonate with the reader, giving them a reason to invest in hearing your message and responding to it. Copywriters don’t just write content. They break down psychological barriers. They tell stories. They use SEO and information as tools, conjuring narratives that not only attract visitors, but follow through by converting them into customers. They invite your audience to trust you, and reassure them that it’s a smart decision to do so. They’re consultants without the consulting price tag, who know what your customers want to hear and how to reconcile that with your brand voice. In a nutshell, professional copywriting is the difference between content that gets ignored and content that gets seen (and shared). More than just a luxury that spruces up your content’s presentation, it’s a fundamental driver of audience appeal, which leads directly to conversion. Your message is too important to let it be overlooked, so trust in a copywriter to make sure it’s heard. 3: S. Austin, N. Newman (2015). Attitudes to Sponsored and Branded Content (Native Advertising). Reuters Institute for the Study of Journalism; Digital News Report 2015. Patrick is a web copywriter and the resident geek of T4G’s Content Services team. His experiences writing copy for a diverse range of clients have spanned formats and topics ranging from musical instrument product descriptions to news articles about U.S. national parks. Outside the office, he sharpens his writing skills through narrative fiction that goes hand-in-hand with his hobbies of PC gaming and building original LEGO® creations. When Patrick’s Vitamin D reserves run too low, he can be found replenishing them on the saddle of his mountain bike.